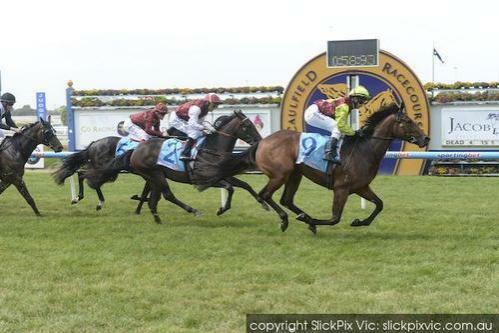 Debutant Top Sight’s big finish enabled the filly to swamp her opposition from last to win Wednesday’s Jacob Park Thoroughbreds Plate (1000m) at Caulfield. Her rivals beat Top Sight for speed early in the $35,000 contest but jockey Michelle Payne did not panic despite having the entire field in front of her entering the straight. Payne steered Top Sight to the middle of the track before the daughter of Bon Hoffa showed impressive acceleration to score what became a soft 1-1/4-length win. The jockey said Top Sight’s lack of early speed was a contrast to the pace the youngster showed in her jumpout at trainer Ciaron Maher’s Caulfield base. “In her two jumpouts, she has jumped and led and we expected her to do the same today,” Payne told TVN. “The horse on my outside gave her a little squeeze early and put her out the back. The speed was genuine and she got a bit lost back in behind them with the kickback and everything. “I was pretty happy where I was. The speed was good and we know Caulfield can suit horses further out when the rail is out 14 metres swooping. Maher said the Ken King Thoroughbreds-syndicated youngster has done everything right in her first racing preparation, which culminated in her first-up Caulfield success. “She’s a no-frills filly in her first preparation,” Maher said. “She’s gone all the way through quite sound and quite sensible. Congratulations to Top Spirit’s owners (Ken King, Devfam Syndicate, Shane Britten, Jan Mills, Gary Raymond, John Ballenger, Paul Hahnel, Clarkies Syndicate & Craig Stewart) on their lovely filly’s terrific success.